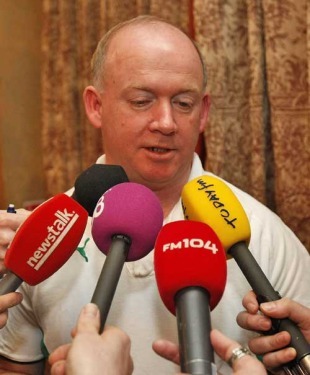 The Irish Rugby Football Union has confirmed that Declan Kidney will not be offered a new contract when his current deal comes to an end on June 30. Kidney's role as head coach of Ireland came under increasing pressure during the Six Nations as they recorded just one win from their five matches. Following "an in-depth review process carried out by the IRFU's National Team Review Group (NTRG)", the body in charge of Irish rugby opted against handing the former Munster coach a new deal. In Kidney's place, Les Kiss will take temporary control for the summer tour to North America, assisted by Gert Smal and Anthony Foley. The IRFU will now look for a replacement for Kidney and Philip Browne is confident of securing a "world-class coach" to take Ireland forward. "We would like to sincerely thank Declan for his commitment to Irish rugby," Browne said. "His contribution and involvement across the spectrum of Irish rugby delivered under age, provincial, Grand Slam and Triple Crown success, and epitomises his passion, belief and commitment to the game. "With a host of new and emerging talent at every level, and despite the clear challenges ahead, we are confident of securing another world-class coach to work with this talented and ambitious group of players." Kidney took on the Ireland reins in 2008 when he replaced the departing Eddie O'Sullivan. He led Ireland to the Six Nations Grand Slam in 2009. Two years later, in the run up to the 2011 World Cup, Ireland lost all of their warm-up matches but rallied to reach the quarter-finals of the tournament. Since then Kidney has come under pressure to turn Ireland into a championship-winning side. They crashed to a 60-0 defeat in New Zealand in the summer and, although they picked up morale-boosting win over Argentina in November, it seemed likely that a poor 2013 Six Nations would spell the end for Kidney's time in charge of Ireland. Despite a lengthy injury list - which included the likes of Paul O'Connell, Stephen Ferris and Tommy Bowe - Ireland stunned Wales to win 30-22 in the championship opener. But that win proved to be their last of the competition, with Ireland losing three and drawing just one in their final four matches - defeat to Italy seemingly the final nail in Kidney's coffin. Ireland will now hope to pick up victories against the USA and Canada this summer while the IRFU searches for Kidney's permanent successor. Reds and former Stade Francais coach Ewen McKenzie has been linked with the post and he recently announced that he would be seeking a new job at the end of the current Super Rugby season. But despite his announcement coming at the same time as Ireland's loss to Italy in the final round of the Six Nations, McKenzie has previously played down any notion of him stepping into Kidney's shoes. "I always say timing is everything but sometimes it won't matter what the timing is as interpretations are always varied," McKenzie wrote in the Sydney Morning Herald. "For example, the connection of Ireland losing on the weekend and my announcement were purely coincidence. "I didn't wake up on Sunday and see Ireland lose only to think I should hold a press conference to capitalise on that. Nor did Ireland ring me up and offer me a job when as far as they and the world knew, I already had one."